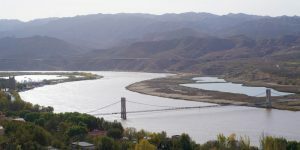 Most visitors come here to visit Shapotou 沙坡頭 where the Tengger Desert 腾格里沙漠 (covering an area about 36,700 km2 and is mostly in the Inner Mongolia) meets the Yellow River. I had a fun morning in this scenic area. People over 60 enjoy a free entry. We only paid ¥60 for transportation (¥15 for the shuttle bus, ¥15 for a ride on the cable car or a slide down the sand dune and ¥30 for a walk on the new 3D glass bridge over the Yellow River). We should have heeded the advice of the lady at the ticket office and only paid for the glass bridge walk. The walk is so short that one can do without a bus ride. There is a free escalator taking visitors to the top of the sand dune and coming down. Hence, there is no need for a cable car ride. 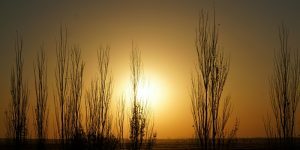 Desertification has been a daunting problem: Tengger Desert has been increasing in size. 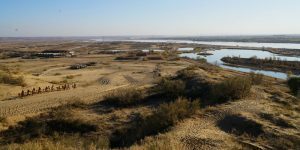 China has set up a world-renowned Shapotou Desert Experimental Research Station at the southern end of the dune sea on the banks of the Yellow River. Lands stabilised in the 1950s are now used for fruit and vine crops. We took a short ride on the shuttle bus and got off at the bottom of the sand dune. Then we walked to the end of the massive dune for a free ride on the escalator to the top. 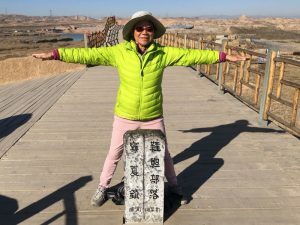 Standing on the top of the sand hill, I am amazed by the awesome landscape and scenery: the expansive desert to the north, the Yellow River bend and boundless oases sitting beautifully on the river banks. From here, one can take a camel ride and take other adventurous activities in the desert. I love sliding down. But the staff would not allow anyone over 60 to slide down for safety reason. I had done it several times and it is not dangerous. This is just another example of bureaucracy and excessive parental control! This was my first walk on a glass bridge which is in fashion in China. Many tourists also jump for a photo shot. If many people jump at the same time, it would pose a hazard. The park administration should tackle this dangerous act rather than stopping me from taking a slide down the sand dune. Right? We did not bother to take the shuttle back to the entrance. As we saw cruises down the river, we asked Su to drive us along the river bank. He was not enthusiastic as it would consume extra petrol. At the end, he was curious too and drove along an old route for some 50 km. There was no traffic nor tourist. 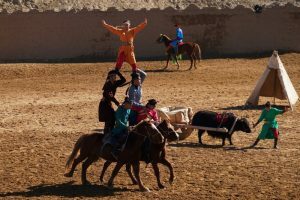 It is the most memorable scenic ride of the Ningxia trip. After a nice lunch with the best mutton that melt in my mouth, we sat off again. Su cannot drive without GPS which took us to the normal entrance of the Tonghu Grasslands that opens in the summer. Now it was closed. Su got lost. I had however seen road signs and asked him to follow the side road. He was not pleased and upset by my navigation. After searching for over 15 minutes, we finally found our way to the grassland scenic area which was now brown and dull. 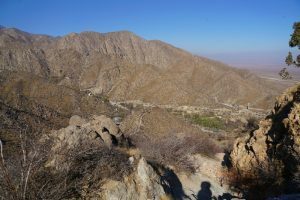 As it is part of the desert, there are always plenty of things to do. We ended up spending over an hour in this quiet corner of Tengger Desert. 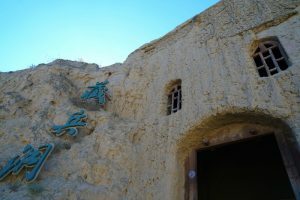 The sand dunes are pretty but nothing compared with the Mingsha Mountain in Dunhuang. 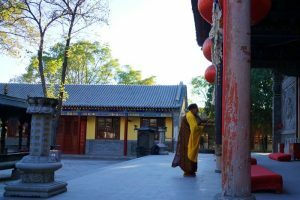 We returned to Zhongwei and tried to visit a temple in the city centre. We were too late: it was closed. We strolled along the main streets around the Drum Tower, had a light dinner and had a stroll in the park. Half a dozen groups of men and women were dancing or exercising. But I hate the loud music put on by each group. Everywhere is noisy. Where can I find peace? 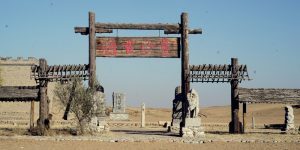 We set off again at 8am heading to the 108 Pagodas 佛塔, an ancient site located on the western shore of the Yellow River. Grand temples which had once stood on this site, had long gone. Only the pagoda remains. Dating from the Yuan Dynasty (1271-1368), the 108 pagodas form in 12 rows, narrow at the top and wide on the bottom in the form of a triangle. 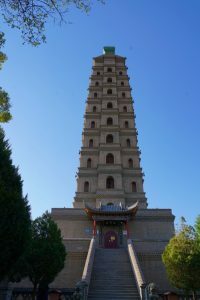 The pagodas were built in a pearl-shaped top covered with lime, looking like the white pagoda in Beijing Miaoying Temple. 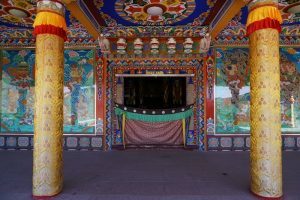 The 108 Pagodas has been extensively renovated. I find the museum on pagodas in China more interesting and educational. We left after an hour. 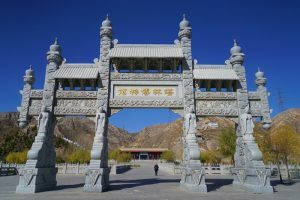 Our second stop was at Western Xia Imperial Tombs西夏王陵 located at the foot of the Helan Mountains. We arrived about 12:30 pm and only paid ¥20 for the shuttle bus. As it was Su’s birthday, we invited him to go in and paid for his ticket and bus ride. 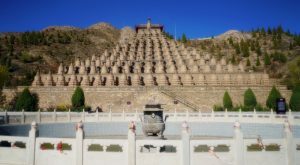 The tombs consisting of nine imperial mausoleums and 250 tombs of imperial relatives and officials, is one of the largest and best-preserved imperial graveyards in China. 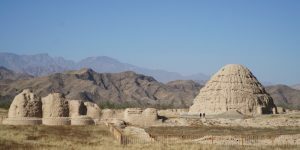 The Western Xia tombs are different from those Ming and Qing imperial tombs. 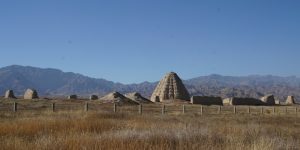 They are earth and brick constructions reflecting the culture of this ancient kingdom. 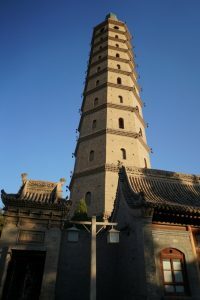 According to archaeologists, octagonal glazed-tile pagodas once stood by each tomb. Each main tomb, encircled by a wall with an entrance gate in each direction, has an independent group of buildings and an array of watchtowers and four corner towers, outer city, pavilions housing stone tablets, sacrificial hall and coffin platform from south to north. But today, visitors can only find piles of relics. The tombs cover an area of about 50 km2 and some 17,000m2 have been excavated. 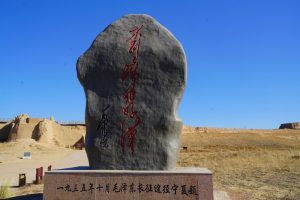 So far only No 3 mausoleum of Western Xia’s first emperor Li Yuan Hao has been completely excavated. We first visited the museum with easily digested presentation on the 190 years of history of the dynasty from 1038 to 1277 and its ten rulers. We then walked to No 3 mausoleum nearby. I can still roughly figure out the walls encircling the tomb, the corner towers, entrance gate and pavilions. 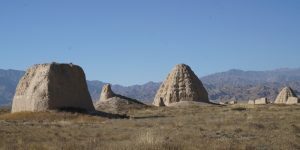 Then we had a long ride to Tombs No 1 and 2 that we had seen from the highway. There is no illustration and I have no idea who was the owner. 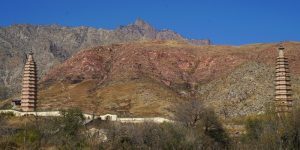 It is atmospheric to look at these ruins with Helan Mountains in the background. Bing and I planned to take Su to a well-known restaurant in Yinchuan for an early dinner. Unfortunately, the restaurant was not open till 5pm. We found a steak house and Su had a steak (¥158) as a treat. The meat was fine but the cooking was not up to the standard yet. Around 5:30pm, we arrived at the 4-star Xifengjia Hotel where we would stay four nights. We wished Su a Happy Birthday and a safe drive home. 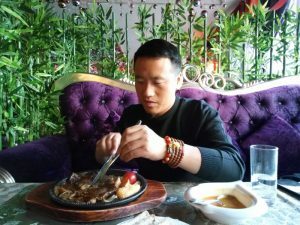 Su was naughty: he did not stop at Lanzhou as planned and drove non-stop for over eight hours covering some 800km. 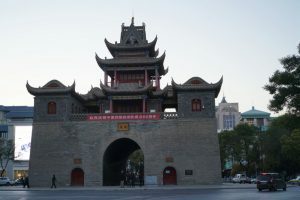 Yin Chuan 银川 (meaning “silver river”), capital of the Western Xia Empire of the Tanguts, is now the capital of Ningxia with a population of about 2 million. With the Helan Mountains in the west and the Yellow River in the east, it enjoys beautiful scenery and favourable conditions for agriculture. In the evening, we explored the old city area near the hotel. We first walked to the Drum Tower and then strolled leisurely for over an hour. Based on the information in hand, we expected to find a less developed city. 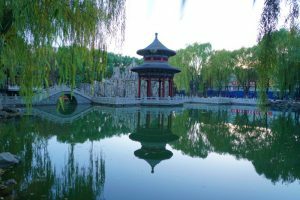 But Yinchuan laces with many city parks, a 10-lane ring road, many well-designed modern high-rise buildings and hotels, has taken us by surprise. The pedestrian streets near our hotel were lively and tidy. The shops sell fashionable clothes, casual wears and shoes. A nice surprise! 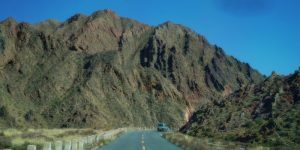 The Helan Mountains 賀蘭山are an isolated desert mountain range forming the border of Inner Mongolia’s Alxa League and Ningxia. It stretches about 200km from the north to south and 15 to 25 km wide with an average altitude of about 2,000m. The highest peak is 3,556m. They run north-south parallel to the north-flowing Yellow River in the Ordos Loop section. 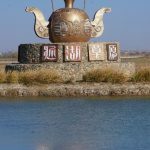 To the west is severe desert while there is extensive irrigated area to the east with the cities of Yinchuan and Shisuishan. Today, we had a new driver, Ha from a town some 20 km from Yinchuan. 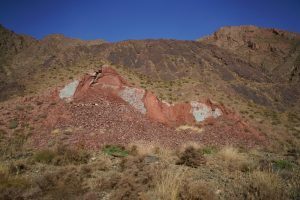 Our first stop was the Helan Mountains Rock Paintings, a must-see for visitors. 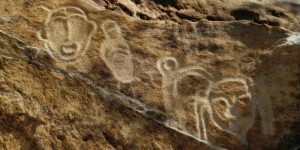 Created by various ethnic groups 10,000 to 3,000 years ago, the works carved on the rocks include life and dreams of the people, their nomadic life, animals and human images, sacrifices to gods, carts, stone chains, axes, knives etc. Carving relating to myths, legends and genital worship are particularly interesting. 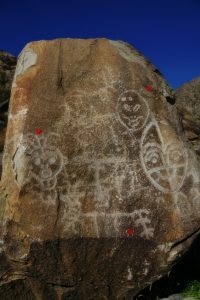 I have seen rock paintings in many remote areas in Australia, India, Namibia, Sudan and Algeria. The ones here are interesting with some Chinese characteristics. As we were only allowed to walk about 100m along the gorge with half a dozen of spots with greater concentration of paintings, I found the ones seen before in India and Africa more impressive. 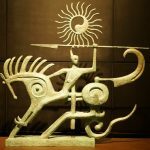 Nonetheless the museum on all prominent rock paintings sites all over the world is most informative with some good replicas. Before leaving, we visited the Han Melin 韓美林Art Museum which was opened in December 2015. 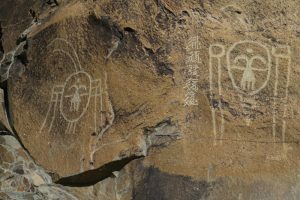 Born in 1936, Han has been deeply impressed and inspired by the ancient rock paintings in Helan Mountains. Inn 2010, he donated 1,000 pieces of his work to Yinchuan municipal government and an art museum to house the works. The building looking like a natural form born out of the rock, is an art work and impressive. He is a most creative and a prolific artist whose works cover paintings, calligraphy, sculpture, ceramics and dyed woven textiles. 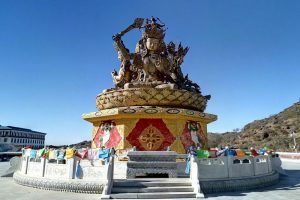 Our second stop was at the Twin Pagodas at Baisikou with free entry. But two men in uniform asked us to pay ¥5 for our car though Ha had parked his car outside the car park. We did not bother to argue but wonder whether they had authority to do so and where the money might have gone. Then we spent a few hours in a national park scenic area with three peaks nearby. No entry fee for people over 60 again. Despite the great descriptions, we found the area brown and barren. We took a hike to one of the peaks. Bing walked for 15 minutes while I walked on. After another ten minutes, the peak was still nowhere in sight. I therefore turned back and met up with Bing at the entrance at 3 pm. We started to head back to Yinchuan to see the Haibo Pagoda海宝塔 in the Haibota Temple海宝寺. 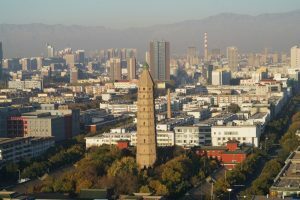 It is a brick pagoda in square shape (19.7m on each side) with nine floors at a height of almost 54m. It is said the temple was once a lake and the pagoda was in the island of this lake. It is not clear while pagoda was first built. But it was surely rebuilt during the reign of Emperor Qianlong in the Qing Dynasty. We did not climb to the top of the pagoda for a panoramic view of the city. We went to see Cheng Tian Temple 承天寺and 11-storeyed pagoda (1055 AD) with relics from 11th century. The temple was subsequently severely destroyed by war and earthquake. It was restored and expanded in 1739 AD and reconstructed in 1820 AD. As we did not enter till 5 pm, we had no time to climb the pagoda for a panoramic view of the city. I enjoyed a leisure stroll inside the temple with nice garden with old trees and well-preserved buildings. In the evening, I had eight students from the Ningxia University. 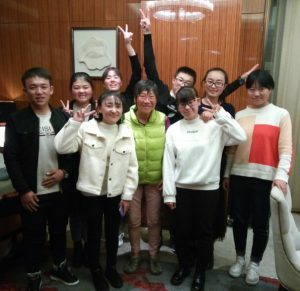 They have been sponsored by the Yellow Earth Foundation a charity set up by a former colleague in 2009 to give scholarships to students, to undertake irrigation projects and to improve productivity of farmers in remote areas of Ningxia to improve for dinner. It is great to meet this group of students from Guyuan who had been sponsored by the foundation since high school. Now they are in Year 1 of the Ningxia University. These young people are impressive and positive with a promising future. 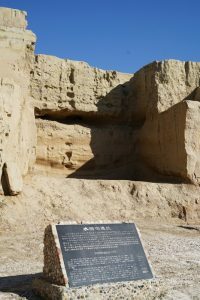 Human activities began in Shuidongguo 水洞沟 some 30,000 years ago. 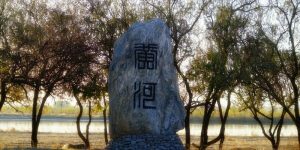 In 1923, two French biologists dug out many stone tools and animal fossils making Shuidongguo China’s earlies excavated site of the old stone age (300 million to 10 thousand years ago) and the “Birthplace of Prehistoric Archaeology in China”. 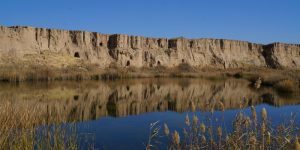 Shuidongguo is part of a Yardang landform with cliffs, hollows, and quicksand. In the Ming Dynasty, it was a military defence base along the Great Wall. A lot of military buildings and facilities were built to defend against the northern nomadic tribes. We set off after 8:30 am and drove 19 km to Shuidongguo (a 5A scenic area). People over 60 pay ¥160 for a combined ticket for 16 sites, four modes of transportation and a performance. We had an excellent morning. Our tour began at the museum with a brief introduction of history of the area during the Old Stone Age. Many of the objects unearthed are now on display in the museum. There is also a 3-D film including dramatic effects of an earthquake. Then we took the shuttle bus to the archaeological sites with guides trying to explain at half a dozen spots. I followed a path through the Reed Catkins Valley measuring 3km long and surrounded by steep cliffs on both sides. Reed catkins have different colours each season, creating different atmospheres for visitors. It would be fantastic to walk the whole length of the valley which leads to the Hongshan Lake. But I had to follow others to go to a viewing platform on the East Line of the Ming Great Wall. I saw several Beacon Towers on the wall that were once used for message delivery. Then we had a camel ride. Perhaps the park authority wants to give visitors a feel about the desert. 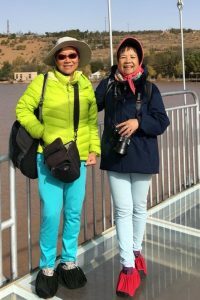 Next, we crossed the Ming Great Wall to reach a pier for a boat ride on the Hongshan Lake, a natural lake covering an area of 1.8km2. Apparently, it is rare to see such a big lake in this Yardang-landform site. When we got off, we walked through a reserve and saw a couple of ostriches. Here we could either take a bamboo raft or a horse cart ride to the performance venue. I took the raft which is fast and comfortable. The lake shore looks particularly enchanting with reeds lit up by the autumn sun. 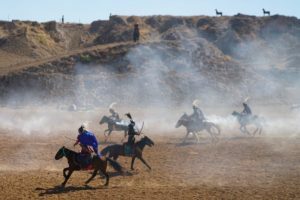 We watched a spectacular Mongolian horse-riding show with about 100 performers. Worth watching. After the performance, we spent another 40 minutes walking through the famous Troops Hidden Cave full of labyrinth-like structure and excellent design. Used for hiding soldiers and as a base for sneak attacks on invaders, the cave has all kinds of military facilities including galleries, gears, concealed weapons, observatories, weapons storeroom, etc.… There are a variety of rooms such as lounges, meeting rooms and kitchens for generals and soldiers. 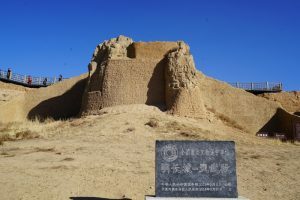 The last stop was the Hongshan Fortress built in the shape of square measuring 302 meters on each side. It is said that there are three different passages leading to the fortress from the Troops Hidden Cave. But only one has been found so far. Now it serves as a museum. We left Shuidongguo after 1:30pm and stopped for a lunch in a small restaurant by the road side. We found the right place because it was busy. Though the food was good, we wasted an hour waiting. Yellow Sand Ancient Ferry 黄河古渡航, one of the eight famous sceneries in ancient Ningxia, is located at the crescent lake in Xingqing district about 50 km from the city. It was the most famous ferry in Ming and Qing Dynasties. It is said the Qing Emperor Kangxi disguised himself and went out of the Forbidden City and took a ferry here to begin his journey. 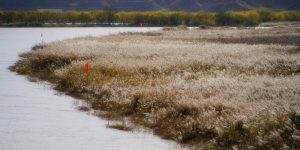 Given the rich history and potential for eco-tourism, efforts are being made to develop a 4A scenic spot with an area of over 30km2 comprising the Yellow River, the ancient ferry site, the desert, wet land, the lake and countryside scenery. We paid ¥60 for entrance fee and a shuttle bus ride to the ferry site. But there is not much to see at the so-called ancient ferry site. Everything is new and tastelessly done up. 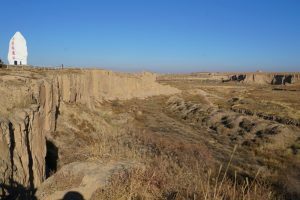 The only thing we could do was to explore the area on foot or take a camel ride. We made our way to the top of the highest sand dune without problem. 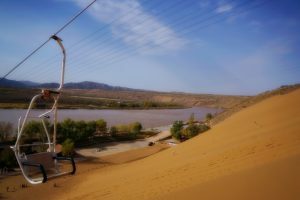 Wow, we had a wonderful 360° view of the desert, the Yellow River, ferry site and the lush river countryside. The quickest descent is to tread through the sand or slide down. This was something I was forbidden to do at Shapotou. We had a fun tumble down the steep slope of the sand dune. Fantastic! We left at 5:30pm and drove over the new the Yellow River Bridge at sunset (Ningxia City has now five bridges over the Yellow River). But, the connecting highway to the city is still under construction. As a result, we spent an hour and a half to return to our hotel. 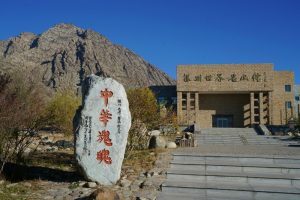 The Ningxia Museum is ‘must-see’. But it closes on Mondays. 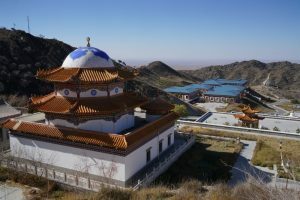 We therefore decided to visit the Alashan South Temple (Guangzong Temple廣宗寺) located on the other side of the Helan Mountains in Inner Mongolia (about 70 km from Yinchuan). 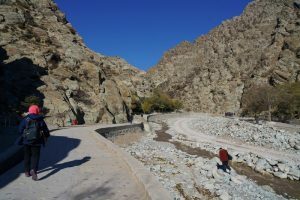 We had a pleasant drive passing through vineyards at the foot hills of the Helan Mountains. Once we crossed a pass descending into Inner Mongolia, the scenery changed completely. We were back in the Tengger Desert again. We took the country road which is not as good as those in Ningxia. There was not much traffic on the road. I paid a full-price ticket (¥80) to enter this scenic area with an area of 3,900 hectare comprising a temple area and primeval forest. The scenic area is green, beautiful and tranquil. 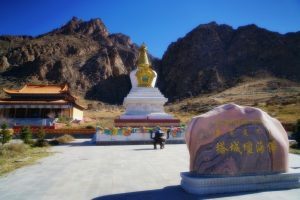 The temple first built in 1756 during the Qing Dynasty is famed as the burial ground of 6th Dalai Lama. 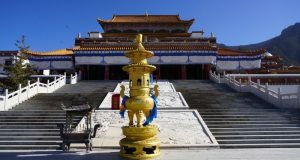 The temple has many valuable relics including a ring bell from Xuanzang and a silver flask from 8th Panchen Lama. The temple had about 200 buildings and 1,500 monks at its zenith. The temple was severely destroyed during the Cultural Revolution and some 70 buildings have been rebuilt. 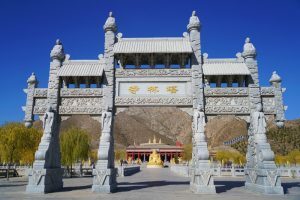 Since we had come all the way to Inner Mongolia to see the South Temple, we must see the North Temple (also known as the Yanfu Temple福恩寺) which is only 60km away. I bought a half-price ticket (¥35) and had a pleasant stroll in the area. First built by Qing Jiaqing Emperor in 1804 AD, the temple was destroyed in 1877 AD. It was later rebuilt and expanded, Then, it was severely destroyed during the Cultural Revolution. The temple has been rebuilt since 1992. Today, it has over 100 buildings including 15 temples, a 10m-high pagoda. We headed back to Yinchuan after 2:30pm. Ha’s car was running low on natural gas and he had to find a gas station. 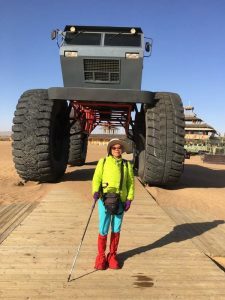 Inner Mongolia is less- developed and we had difficulties in find a station in Alashan that was open. We finally found one with six pumping points. But we had to queue for half an hour. Without any directions from the staff, drivers waited in the queue while the pumping points in the front row were not used. Poor management. 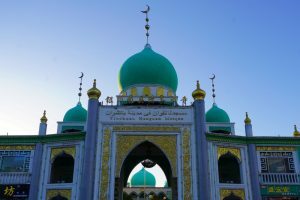 There are about 2,000 mosques in the Ningxia Province. We finished our Ningxia tour at the Nanguan Mosque關清真寺. 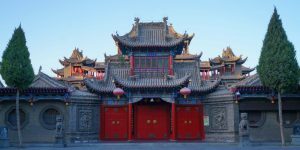 First built during the Yuan Dynasty, it is one of the largest mosques in Ningxia with an area of over 2,000m2. As it was built on a few old stumps at that time, it had been called “Stumps Temple”, which had been destroyed later and rebuilt subsequently. The architecture of the mosque is a combination of the Arabic and Chinese styles. The two-storeyed Arabic style structure is featured with window, arched doors, three grand green domes and two minarets. There are 32 huge pillars in both sides of the front and back halls. 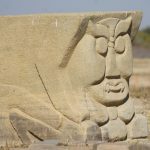 In the middle, a 32 metres high ancient style scripture is carved. Non-Muslim visitors cannot enter the hall. We had dinner in a well-known restaurant near the Drum Tower. We were disappointed as the mutton was tough and tasteless.